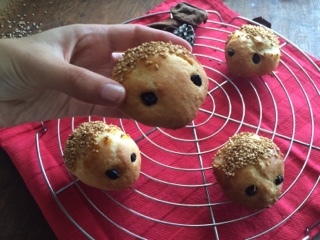 Hedgehog bread rolls recipe for kids. 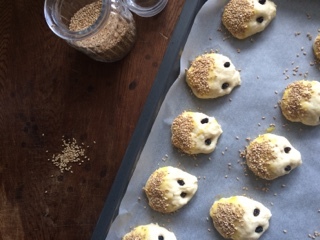 2.Make the hedgehogs: Roll the dough into balls about the size of a large lemon, Pinch and squeeze one end to form the face. Place raisins or hocolate chips for the eyes. 3.Brush back sides with egg yolk and sprinkle the brushed sides with sesame seeds. 4.Bake the bread rolls: Place in preheated oven and bake for about 25-30 minutes until golden brown.